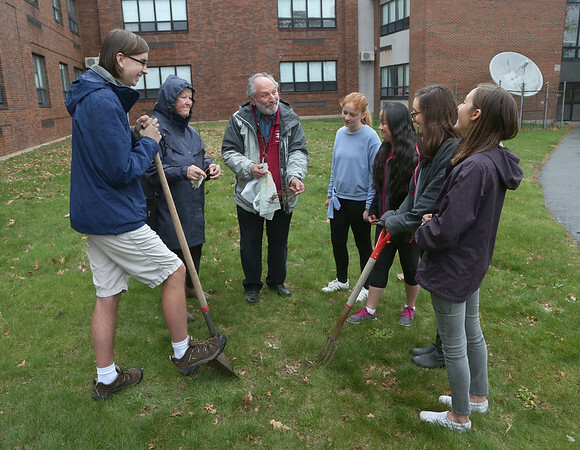 Seventh grade science teacher and Green Team advisor Bob Allia, center, shows a group of students the place where one of a pair of dogwood trees will be planted during a brief Arbor Day observance Friday behind the Rockport Middle and High School. Because of the weather, the group decided to postpone the actual planting until next week. From left are sophomore Nathaniel Kirby, Rockport Garden Club member Peggy Coonley, Allia, eighth-grader Sarah VanDerpool, sophomore Amanda Verga, freshman Amarrah Woo and junior Cat Rania. The two dogwood seedlings were donated, along with a pair of sugar maple seedlings for planting near Rockport Elementary School, by the Rockport Garden Club and the Rockport Rotary Club.